How does social media impact your internal organization? 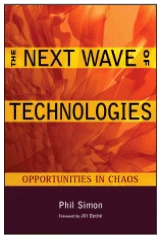 Your new book The Next Wave of Technologies deals with how organizations can adopt and adapt to new processes and advances. Do you see social media participation as one of the hurdles businesses now need to successfully clear? Absolutely. While many organizations have got social media religion, there are many others still swimming against the stream. Or, paradoxically, they claim to embrace social media while forbidding their employees from being on Facebook or Twitter. As you know better than I, we are in the early innings of social media. My hunch is that, as more organizations are able to successfully utilize social media, the dominoes will start to fall. In many industries and in many types of organizations, however, that’s not going to happen tomorrow. Change takes time. You talk about ensuring that an organization is “ready” for a new technology. Are there specific markers that indicate readiness within companies? Well, I’ll try to keep the answer short because complete answer is a long one. Yes, there are different reasons for different companies to adopt different technologies at different times. For example, the markers for a jump to cloud computing for a declining retail company are quite different than the markers for a growing startup to embrace a business intelligence application. I’d also argue that the organization’s IT philosophy is critical in successfully rolling out new technologies. Some organizations merely want IT to play cop: guard against threats, lock down data, etc. In other organizations, IT is more of a strategic partner, helping individual lines of business overcome challenges. Expecting a historically reactive IT department to suddenly become proactive is not reasonable and will probably result in failure. Each chapter in the book provides, at high level, detail about when, why, and how to implement each technology. My friend Amber Naslund writes a lot of the need to “manage up” in social media—making sure the folks doing the work are communicating effectively to the C-Suite. How do you see the parallels with technology adoption? I like the way that you phrase that. Yes, there are strong parallels. Enterprise 1.0 was very much top-down. Organizations evaluated, bought, and deployed software that everyone was supposed to use. Enterprise 2.0 is different. For instance, open source software and the Freemium model are allowing for a more organic, bottom-up adoption of many applications and technologies. This is in stark contrast to the top-down approach of almost all Enterprise 1.0 IT projects. In short, collaboration and adoption need to go up and down, not just side to side. There is of course relentless chatter about social media ROI and success metrics. Measuring social media is viable, but not obvious. Is the same true in adoption of new technologies? How should companies evaluate success? Great question. The ROI of many Enterprise 2.0 technologies can be relatively easily derived. For example, an organization that would have spent $5M over ten years on a traditional ERP or CRM application (bought from an on-premise vendor) may spend $1M on a SaaS alternative such as Workday or salesforce.com. Alternatively, an organization may use the open source LAMP stack and OpenOffice and save a great deal on software licenses. Note that open source does not mean free, however. For other technologies, the ROI is a bit tougher to quantify. How does one easily put a value on better data management via MDM? What is the precise ROI of being able to understand your customer base better via business intelligence (BI) applications? While ROI is important, a discussion of evaluating success and benefits is remiss without considering risks—that’s why there’s a chapter on enterprise risk management. Any new major enterprise technology endeavor introduces risk. However, many times not doing something is actually the bigger risk. As a consultant, you help organizations walk the tightrope of technology adoption and integration. I play a similar role in the social media arena. But wouldn’t companies be better off if they didn’t need consultants? What’s the ideal internal/external dynamic when you’re dealing with something transformative like a huge new software implementation, or social media strategy? Well, if organizations didn’t need consultants, then I wouldn’t have a job. 🙂 I’d argue that organizations in this economy are lean by necessity. They can’t possibly employ all of the people with the skills required to successfully lead organizational change and the adoption of emerging technologies. People like me primarily exist to get a specific job done when the organization lacks the internal expertise. Even when the economy improves, the need to “plug and play” consultants for particular jobs and projects is going to increase, if anything. As for the ideal dynamic today, Enterprise 2.0 differs from its predecessor. On mid-1990s projects, for example, typically organizations defined hundreds of requirements and went through protracted RFP processes in search of the best software and system integrator. Long and expensive consulting engagements often missed their mark. This was essentially the subject of my first book. With Enterprise 2.0, the ideal environment is one of collaboration and achieving high-level objectives. For example, garnering a better understanding of customer retention might be the goal of a project, not checking off pages and pages of detailed requirements. Okay folks, the comments are yours. Please tell me (and Phil) how social media is changing YOUR company.